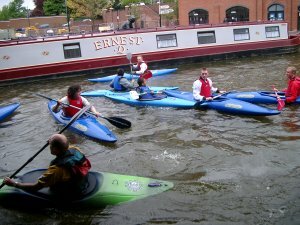 Mercia Canoe Club is the canoe section of the Coventry Canal Society. The club is based at the heart of Coventry, in the old Canal Basin warehouses. We welcome all ages and abilities – from beginners just wanting to have fun, to those seeking specialist coaching. Our coaches have nationally recognised coaching, water safety and first aid qualifications, and are able to train and assess you from being a complete beginner through to the British Canoeing Star Tests 1-3 (for those aged 16 and over) or the Paddlepower awards (for younger paddlers). The new Star Award scheme provides the support and encouragement paddlers need to get out and go paddling. We can also get you ready for any higher awards or coaching course you may wish to start, with plenty of opportunity to develop your skills. We have a full range of paddles, canoes and kayaks available for different sizes and abilities and can provide all the necessary safety equipment, such as buoyancy aids and helmets. This includes open, stable kayaks for anyone to jump into, shorter more dynamic boats, as well as flat water racing and touring kayaks. Pay and paddle per session as a visitor or join the club if you want to paddle regularly. Youth Groups, work mates, Scouts, Guides or those doing the Duke of Edinburgh Award Scheme are welcome. Individual sessions can be arranged to meet your needs. For an introduction, try flat-water skills and have a go at the British Canoe Union individual Star Tests. 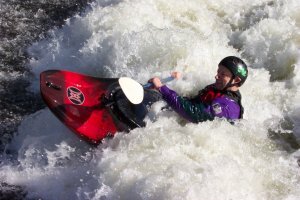 Try touring or racing; step up to moving water and join us at Stratford weir, Ironbridge, Matlock or Symonds Yat; move on to the Tryweryn, Tees, Washburn or the Dart for more challenging water. The Saturday sessions begin at 2 P.M at the Canal Basin. To find us, leave the ring road, heading up the Foleshill Road. Follow signs for the canal basin. Turn immediately first left into Leicester Row. Alternatively, we are only a short walk from the city centre via Bishop’s Street. Unit 1 is at the far end of the warehouse on your right, or come up the steps and see us on the water. For more ways to contact us, and a map of our location, see the contact us page. No need to book – just turn up on a Saturday for your first session. Bring a towel and a change of clothes. If it’s windy or cool a waterproof jacket will keep you warm on the water. Changing rooms and a clubroom are available, as well as lockers to store your valuables.